“Ma’am, what can I do to help you?” The IAH skycap hovered over me as I unzipped my suitcase at the curbside check-in and tried to stuff an armload of sweaters, pants and jackets into it. “Here, let me take those hangers. Can I sit on this bag for you? You have two minutes before they close the check-in.” He was concerned. I, on the other hand, was near tears. My husband and I had been planning our retirement and an extended trip to Paris for over six months; for weeks I lay in bed pondering the details, repeating quietly “I think I can …” I am a Virgo, I am organized, everything is under control. To add to the upheaval, we decided to sell our house before we left. We rented a climate-controlled storage unit, and boxed up the personal things, changing the atmosphere from homey comfort to boring “a total stranger can imagine herself living in this house” décor. Artwork by the grandchildren was stripped from the refrigerator. My beloved amateur photographs went into cartons. Clothing was packed away so that the closets would look bigger and more spacious. We took a truckload of boxes and wardrobes to storage, and then waited … living in stressful cleanliness, fearing even to bake a pizza lest the tangy smell would drive away a possible buyer. We set a deadline: we were leaving for Paris on August 31st; the house had to be sold by midnight August 15, or it was going off the market! We were DONE with living in anxiety! At 9 PM on August 15th, we got an offer “that we couldn’t refuse” – recently divorced mother with infant who needed a family neighborhood. We couldn’t turn her down. Perk finished; I went to my closet to start folding my clothes. I rifled through plastic bags from the cleaners, but didn’t see what I needed. With a hint of anxiety, I started slitting the bags to see if my clothes were tucked between less important items. No. The first twinge of panic was replaced by reason: they must be in some unopened boxes in the apartment. Friends had helped us pack; they may have been over-zealous. I opened a few boxes carefully, found nothing except what was labeled on the box top. My anxiety was growing exponentially! As my search grew more frantic, my husband told me to stop, offered to let me shop for an all new wardrobe in Paris, which only added to my panic. I knew we couldn’t afford that! As anxiety melted into dizziness, I began shredding the box tape with my fingernails! I plunged into cartons, scattering books and kitchen utensils, linens and cleaning supplies. The organized apartment became a maelstrom of chaos! If we weren’t at the airport two hours in advance of an international flight, they could refuse to let us board. We had been planning for SIX MONTHS! I had ONE HOUR to get there! I couldn’t breathe!! Looking forward to the ‘rest of the story’. There are about six zillion reasons to love you from this one blog post. First of all, you and Perk are going to Paris (or are already there)!! You’re living my dream right now. If you tell me you’re also writing every day, I may go into a murderous rage! I’m so proud of you. Most people only talk about what they’re going to do when they retire. You’re really doing it AND you have your clothes all cleaned and ready to go. I can’t wait to see what adventures come next! And then we jumped into BOTH cars, drove like characters in the “The Italian Job” back to Cypress, unpadlocked the storage unit and found the clothes, jumped BACK into the cars again, sped to Deb’s house; I swerved into her garage (Chuck had a Mini stall waiting); Deb, with bottles of water in hand, leaped into Perk’s car, we careered across town at 80+ MPH to the airport, staggered out of the Acura with hangered clothes slung across my back and into the helpful arms of the Skycap. We made it … no showers, no glass of champagne at the gate… but we made it! Whew!!! Excellent blog. Glad you made it! Wow you made it Bon Voyage! Glad that you made it! Thanks for letting us help you along the way. It’s a good thing you had already sold the house. 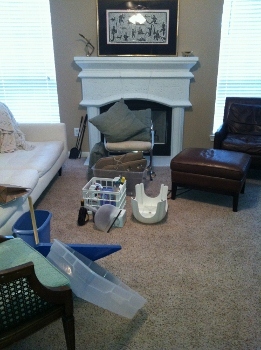 The “after” picture looks like “our house after the robbery!” I’m glad you made it with sanity almost intact.